I am usually regarded as a “Rock Snob,” but I am coming clean about my musical guilty pleasure of the summer – “ Yacht Rock.” That’s right… the soft rock from the 70’s usually played by bearded dudes wearing white tank tops under brightly colored button-downs with band names like Firefall, Starbuck and Orleans. Christopher Cross’s “Sailing” is often viewed as Yacht Rock’s pinnacle, but I think of it more as the nail in the coffin for the genre (sort of like the way Altamont snuffed out Flower Power). By the time “Sailing” faded away with the summer of 1980, folks were ready for a new wave. While Labor Day Weekend usually signals the unofficial end of summer, a true yacht-rocker knows that there’s still a good 4-6 weeks of smooth sailing even on the Great Lakes. The waters are still warm and less crowded, and Seals and Crofts sound ridiculously awesome blaring from the 8-track player on deck. So pass out the cans of Narragansett. In honor of this summer’s guilty pleasure, I will be counting down my Top 3 Yacht Rock artists of all time over this holiday weekend. Ok. The wait is over. In honor of this summer’s guilty pleasure, my #3 Yacht Rock artist is Loggins & Messina. Before Kenny Loggins was alright with Caddyshack, rode right into the danger zone, or cut Footloose as the king of the soundtrack, he was part of this successful duo. Best known for “Danny’s Song” and “Your Mama Don’t Dance,” these twin sons of different mothers cemented their Yacht Rock legend with the 1973 album Full Sail. Nautical references? Check. Facial hair? Check. The opening track, “Lahaina,” points us toward Hawaii and the closer, “Sailin’ the Wind,” anchors this one as a Yacht Rock classic. I am essentially a self-made music nerd. The number of individuals that have influenced my love of rock and roll and specific tastes in music can easily be counted on one hand. When it comes to my musical education, I have pretty much found my own way. It was in the mid-1970’s that my obsession took hold against an aural backdrop of Casey Kasem’s American Top 40 and its opposing world, the legendary FM rock radio of the Northeast Ohio Greater Listening Area. As far as cultivating a fledgling fanatacism for music goes, it was a privilege to be in that time and place. Recording songs from a radio speaker to a tape recorder soon led to buying records. (Captain and Tennille’s “Love Will Keep Us Together” was my first 45.) I quickly became a serious student of pop and rock music. At the time I didn’t think that I had too far to go to catch up on things. The rock era was still relatively young. Heck, I watched Happy Days. 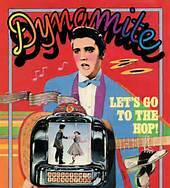 I read about Elvis and The Beatles in the pages of Dynamite Magazine. Little did I know that the depths of rock music were murky, even boundless, and I am still filling in the story today. In addition to constantly soaking up Top 40 and AOR radio, I sought out music on television as much as I could. Variety shows and American Bandstand were in regular rotation, but Don Kirshner’s Rock Concert and The Midnight Special were the real treats if I could manage to stay up late enough. Now don’t get me wrong. There was no real “cool filter” in place. I wasn’t some kind of junior rock critic wunderkind. A highly questionable middle-of-the-road Arena Rock phase figures in my background, and I don’t really remember NOT liking much music. I was just absorbing it all, taking it all in. In fact those aforementioned swings between Top 40 and album rock radio still inform my tastes today. I would continue to explore through the college years with SPIN magazine and MTV’s 120 Minutes program steering me to out of the way musical places. I discovered the Velvet Underground and all of the non-mainstream artists in their long shadow. One only had to see the VU’s albums listed in Rolling Stone Magazine as some of the greatest ever so many times before taking the plunge. Besides they were REM-approved. Another college favorite, The Replacements, led me to Alex Chilton and Big Star. Once in my twenties armed with more discretionary time and an employee discount, I delved deeper into cult figures. I invested in music-geek-must-have boxed sets from Robert Johnson and Phil Spector, and Harry Smith’s Anthology of American Folk Music. Deities of the Rock Snob world like Captain Beefheart, Roky Erickson, Arthur Lee, Gene Clark, Skip Spence, and Jonathan Richman were not far behind. I am really still catching up today as I educate myself on the pioneers of the early 1950’s R&B and the songwriters, producers, and arrangers of the Rock Era’s first couple of decades. Had he known that this education would take decades, I don’t think that there’s any doubt that my ten-year-old self would have still been up for the trip.